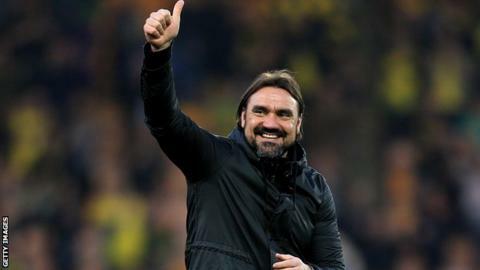 Norwich boss Daniel Farke has extended his contract with the Championship promotion-chasers until 2022. The German joined the club on a two-year deal from Borussia Dortmund II in May 2017 and led them to a 14th-placed finish in his first season in charge. Norwich are currently second and will go top by beating Hull on Wednesday. "It's a great pleasure to work for this massive club every day. I'm over the moon that I was allowed to extend my contract," he told BBC Radio Norfolk. "I'm 100% convinced that Carrow Road is the right place for me to be at the moment. "We would love to get to the Premier League this season but actually we thought it would take longer than this. We want to make a club that is able to stay in the Premier League for the long-term." Assistant head coach Edmund Riemer, first-team Coach Christopher John and head of performance Chris Domogalla have also signed new three-and-a-half year deals. "To finally get to this day is great. It's exciting, we can now continue on and progress and not have this sort of subject hanging over us a little bit," Norwich sporting director Stuart Webber told the club website.